US envoy to Syria expresses hope Russia will continue "permissive approach" to Israeli air strikes on Iranian assets in Syria. The US envoy to Syria said Wednesday he hoped to see more of Russia’s "permissive approach" to Israeli air strikes on Iranian assets in Syria, AFP reported. "In the past Russia has been permissive in consultation with the Israelis about Israeli strikes against Iranian targets inside Syria," US envoy James Jeffrey told journalists in a conference call. "We certainly hope that that permissive approach will continue," he added. Israel has carried out airstrikes in Syria against Iranian targets and weapons that are meant for Hezbollah. These airstrikes have been coordinated with Russia in the past, but relations between Israel and Russia have cooled since the downing of a Russian reconnaissance plane over Syria last month. An IL-20 reconnaissance aircraft was reported missing over Syria in mid-September, following an Israeli airstrike on a military research facility in northern Syria. The plane, which was carrying 15 crew members, was later declared lost, after apparently being downed by a Syria surface-to-air missile. Russian officials blamed Israel for the downing of the IL-20, saying the IDF had provided just one-minute advance notice of the impending airstrike to Russian Defense Ministry officials, adding that the Israeli fighter jets had used the IL-20 to draw the Syrian air defense network’s fire. Israel denied the claims, saying its jets were already out of the combat zone and in Israeli airspace when the IL-20 was downed, and that the IL-20 had been far from the area of the airstrikes during the Israeli operation. An IDF delegation was later dispatched to Moscow to share information collected by Israel as part of its investigation into the incident. The Russian government refused to accept the validity of Israel’s investigation into the incident, however. Prime Minister Binyamin Netanyahu last month told Russia his country must continue to hit hostile targets in Syria to prevent Iran from establishing a military presence across the border. "We understand the existential interest and we support Israel," Jeffrey said Wednesday. 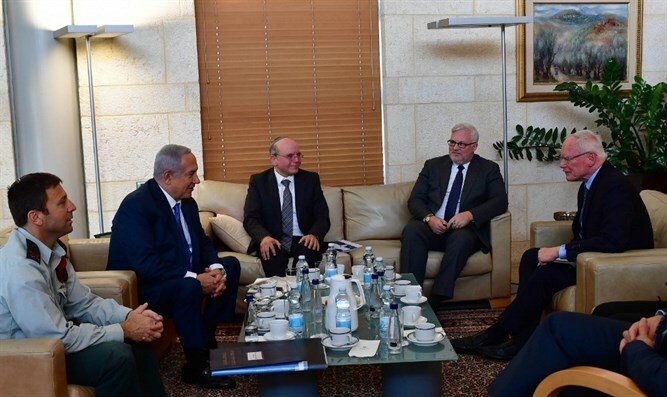 Netanyahu and Jeffrey met earlier this week in Jerusalem and discussed developments in Syria and efforts against Iranian aggression. Israeli officials have repeatedly made clear that Israel will not accept any Iranian military entrenchment in Syria. The Trump administration has taken action against Iran as well, with President Donald Trump withdrawing from the 2015 nuclear deal in May and reimposing sanctions on the Islamic Republic that were frozen under that deal.